Santander UK's Spanish owner is nursing an 8.1% decline in profit from its UK business after a decline in the value of sterling. Still, it posted a profit of 1.87bn euros (£1.59bn) in the first quarter, boosted by its Brazilian business. That was a gain of 14%, beating analyst estimates, according to Reuters data. Inflation, which leapt to 2.3% in February from 1.8% a month earlier, may squeeze household incomes, the UK-based business said. Excluding the fall in the pound, which declined in value against the euro following the UK's decision to leave the European Union, UK profit for the broader bank grew 2.6% to 416m euros. Santander UK took a further £32m charge to cover claims for payment protection insurance compensation. This was insurance customers didn't want, need or understand to cover loan payments. Customers have until August 2019 to claim back payments made for the product. Santander UK's mortgage lending fell after withdrawing cheaper deals in the previous three-month period. First-quarter figures a year earlier were also flattered by a flurry of buy-to-let borrowers aiming to beat April's stamp duty increase for second homes. The bank said it would "continue to focus on customer service in what remains a highly competitive market". 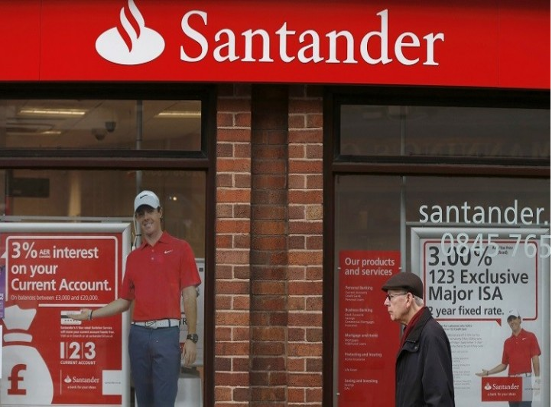 Speaking about the wider business, which includes lenders in Poland, the US, Mexico and Spain, Santander chairman Ana Botin said: "While the environment continues to be challenging for the banking sector, the outlook for Santander is positive."